Fishing boats have been asked to file requests for new boating and fishing licenses by this February 20 as part of the government’s continued effort to better regulate the sector. 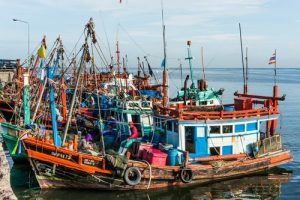 Director-General of the Marine Department, Jirut Wisanjit has advised the industry that many agencies combatting illegal, unreported and unregulated (IUU) fishing have upgraded their systems to better manage fishing boats. The upgrade requires that all vessels being operated for the purposes of fishing be registered and fitted with proper communication devices. The registration will also allow authorities to inspect each boat’s operations and safety. New licenses for fishing will now expire in 2 years with all vessels that wish to fish in Thai waters being required to have a license. Foreign boats will be evaluated by the Marine Department for approval to operate in Thai waters. The checks will particularly focus on illegal labor. Operators of fishing vessels have been given the period between January 20 and February 20 to register for licenses to operate from 2018 to 2020. From April 1st onward, operators of boats without proper licensing will face severe punishment according to the amended Fishing Act.